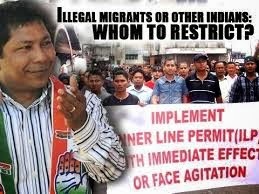 Shillong, Dec 4 : Tribal village chiefs today rejected the proposed bill aimed at containing entry of outsiders and illegal immigration by regulating tenancy in Meghalaya, saying it was not relevant to the issue. "We resolved to reject the proposed bill outright as it is not related or relevant to the influx issue, but instead provides more scope for infiltration into the state," General Secretary, Synjuk ki Rangbah Shnong, R L Blah, said in a letter to Chief Minister Mukul Sangma. Synjuk ki Rangbah Shnong (SRS) is a conglomeration of locality chiefs and chiefs of 43 villages in the state capital and on the outskirts of the city. The SRS did not mention an alternative to the proposed bill nor did it mention whether they supported the pressure groups demanding introduction of the Bengal Eastern Frontier Regulation Act, 1873, that facilitated the restriction of outsiders into the state by way of an Inner Line Permit. A ministerial committee headed by CnRD Minister Prestone Tynsong is in the process of conducting public consultations across the state on the proposed Meghalaya Regulations of Landlords and Verification of Tenants bill. Students of colleges under the North Eastern Hill University have also rejected the bill during a special consultation held with them last month.